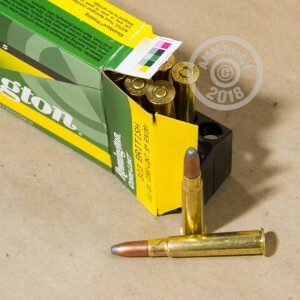 Remington calls this hunting ammunition the "Deadliest Mushroom in the Woods (tm)" and for good reason--the Core-Lokt soft point bullet has helped hunters bring down millions of deer and other game in the decades since its introduction. It uses a mechanically locked core and jacket design to provide maximum weight retention in a cost-effective manner. 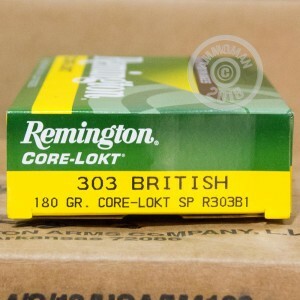 These .303 British cartridges fire a heavy 180 grain version of the Core-Lokt at 2,460 feet per second, striking the target and producing rapid expansion without excessive fragmentation. 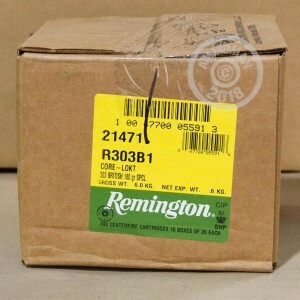 This ammunition is loaded in Lonoke, Arkansas and uses non-corrosive Boxer primers. Each box contains 20 cartridges.